When you have a phone, tablet or other electronic device, you have probably met the situation when you ran out of energy for the best fun. Currently gadgets have a lot of features, unfortunately it is the cost of high energy consumption. 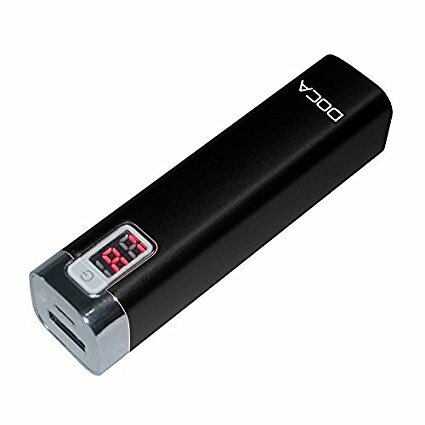 This portable phone charger has a small capacity, as it is only 2600 mAh (also in our online store you can buy many other models with higher capacity), but thanks to this device is very small and very light. At the same time these powerbanki are equipped with digital display. This type of solution is great, because you are always assured of how much energy is still in the charger. Charging with this device is not a problem. All you have to do is insert the cable into the USB socket of the charger and insert the other plug into the socket of the device you want to charge. This is ideal for those who value comfort, usually not even feel that this device is in pants or in a backpack. However, it is a great safeguard in the event of a sudden lack of energy. Portable chargers for mobile phones best equipment and forest hike. When you love social media when you're still checking out what's happening in your forums? What are the current trends in fashion, what new in electronics? In a word, you want to be always up to date. When you ride a bus, it is a great time because you can freely use the internet at this time. On the other hand, how many times did you forget to charge your smartphone the day before? Unfortunately, this has resulted in the fact that you could not use your mobile phone as a daily basis. It is very frustrating. You promise yourself that the next time you're sure you're going to look after the recharge, unfortunately a lot of the things you had to do to make you forget. It is worth to have such a device, which in case of sudden power failure, can charge your phone. It is also a good idea to purchase a device that accumulates energy for a long time. Some portable phone chargers are like toys, you charge them two or three times and then they are thrown away. They no longer say that they do not retain accumulated energy long. So I encourage you to purchase this power bank. DOCA is a reputable manufacturer. These devices hold energies up to 5000 hours. So long ago charging such energy banks, the energy contained in them was available after many months.